Operation of the VSC OFF switch changes the vehicle between normal mode, TRAC OFF mode (AUTO LSD mode) and VSC OFF mode. During normal mode, pressing the VSC OFF switch for a short amount of time changes the vehicle to TRAC OFF mode (AUTO LSD mode), TRAC operation is prohibited, and the VSC OFF and AUTO LSD indicator lights turns on. However, if the vehicle speed exceeds 50 km/h, the indicator lights turns off. When the vehicle is stopped, pressing the VSC OFF switch for 3 seconds or more changes the vehicle to VSC OFF mode, TRAC and VSC operation are prohibited, and the TRAC OFF indicator and VSC OFF indicator lights turn on. Operation of the VSC OFF switch changes the vehicle between normal mode and VSC OFF mode. During normal mode, when the vehicle is stopped, pressing the VSC OFF switch for 3 seconds or more changes the vehicle to VSC OFF mode, TRAC and VSC operation are prohibited, and the TRAC OFF indicator and VSC OFF indicator lights turn on. When the transfer is in L4, VSC is prohibited and the TRAC OFF indicator and VSC OFF indicator lights turn on. When the rear differential is locked, VSC is prohibited and the TRAC OFF indicator and VSC OFF indicator lights turn on. At this time, ABS is also prohibited and the ABS warning light turns on. When the temperature inside the hydraulic brake booster becomes too high, the TRAC OFF indicator light turns on and traction control is stopped until the temperature decreases. If there is a malfunction in the SFI system, the TRAC system will be prohibited and the TRAC OFF indicator will turn on. As there may be malfunctions in the transfer system related to when the transfer operates in L4, check the transfer system first. (a) Check if SFI system DTCs are output (See page ). 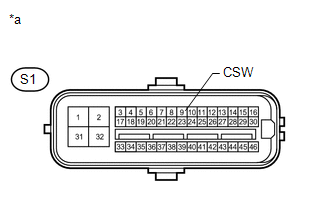 (c) Reconnect the S1 skid control ECU (master cylinder solenoid) connector. (a) Reconnect the S1 skid control ECU (master cylinder solenoid) connector. (e) Enter the following menus: Powertrain / Four Wheel Drive / Trouble Codes. (f) Check that the mode display changes according to VSC OFF switch operation. Display changes according to switch operation. (a) Remove the VSC OFF switch (See page ). 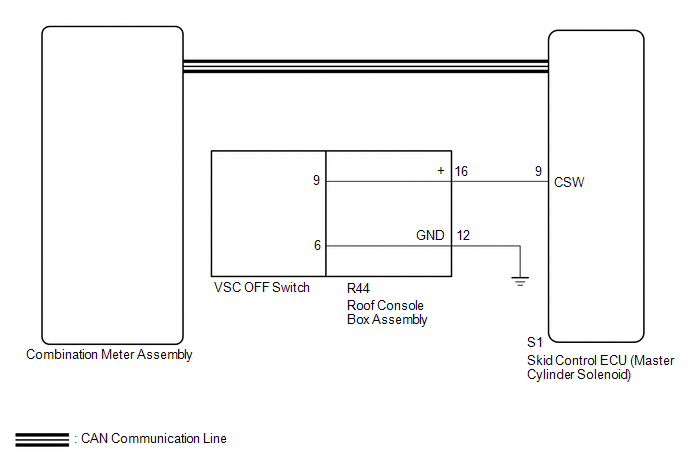 (b) Inspect the VSC OFF switch (See page ).